Adidas, maker of the Jabulani World Cup ball, has rejected claims that it was to blame for England goalkeeper Robert Green's error that led to England drawing 1-1 with the United States on Saturday. Adidas's Thomas Schaikvan said: "We are happy with the ball's performance and we don't think it had anything to do with the goal England conceded. 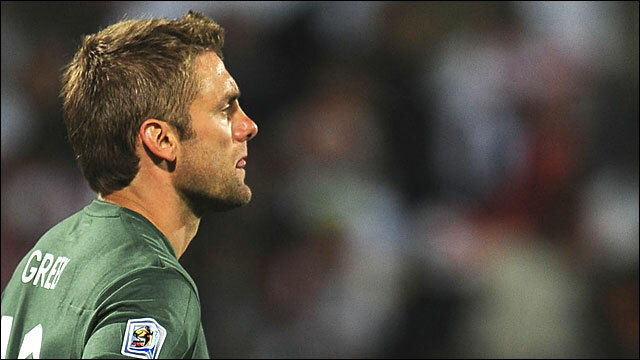 On the contrary, if you look at the games so far, some goalkeepers have been the stars of the tournament. "The Nigeria goalkeeper Vincent Enyeama and United States goalkeeper Tim Howard won the man-of-the-match award in their games, and the South Africa goalkeeper Itumeleng Khune was also excellent against Mexico." Meanwhile, Howard believes the draw with England was a better result than the United States' famous World Cup win in 1950. That 1-0 shock was an isolated success, with the US not appearing in the World Cup for another 40 years, but Howard said the result was evidence of progress. "It is a better result than 1950," he said. "We are better positioned than we were then. We expected to put a performance in and get at least a draw, which tells you how far we have come." "It may appear surprising to you, but it was a defensive choice. That's how the manager presented it to me," Malouda said. "I learned of it at 4pm after the meal. It didn't affect my digestion, the pancakes were very good, but there was real disappointment." Italy coach Marcello Lippi has hailed countryman Fabio Capello as "a winner" and tipped England as one of the teams that can win the World Cup. "England are one of the great threats. It is not because Capello is Italian that is important. It is because he is good, he is a winner," said Lippi. "I have said before that the favourites are Brazil and Spain. "But personally I also feel Argentina, Germany, Italy, France and England can all win and be careful of Holland. They have all come here because they want to win."